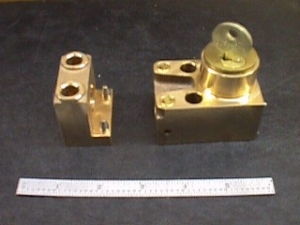 The Superior Door Locking Unit, type B-5003, is an Interlocking unit designed for either surface or sub-mounting for the Interlocking of access doors to various equipment such as electrical cabinets, fuse doors, transmitter cabinets, capacitor banks, access to automated equipment, compartment or cell doors, access doors, etc. This prevents access to enclosures, hazardous machinery, high voltage areas, automatic robotic equipment, high or low temperature areas, chemically hazardous vessels, dangerous gangways, compartments or other restricted areas, etc. until a key, signifying that entry is safe, is inserted in the Interlock. This unit is more suited for accurately aligning doors. For poor aligning doors the Superior type B-857 or B-1496 may be considered. An essential feature of all Superior Access Door Interlocks is the key retaining feature which prevents the removal of the key from the Interlock until the doors are returned to the closed position. The removal of the key locks the door closed. The key, when removed, gives evidence that the compartment door is locked closed. In the usual installation, the Interlock is mounted on the door and the bolt eye is mounted on the doorframe or jam. This arrangement may be reversed. When the bolt eye is brought into engagement with the door Interlock, a latching device within the door Interlock permits the key to be removed from the Interlock. Turning the key projects the bolt member into the bolt eye and locks the door in the closed position. The latching device in the door Interlock prevents the key from being removed in any but the closed position of the door. 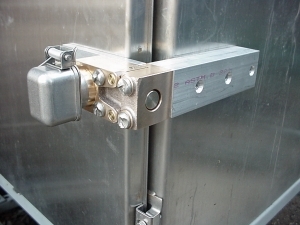 The Superior type B-5003 access Interlock is available in our standard bronze unit or with the lock cylinder totally protected by 300 series Stainless Steel for harsh and high temperature applications such as precipitators, baghouses, scrubbers, petrol-chemical facilities, food process and packaging facilities, robotic welding and assembly, etc. Please see our cut sheet for specifications or contact our factory for details or recommendations. 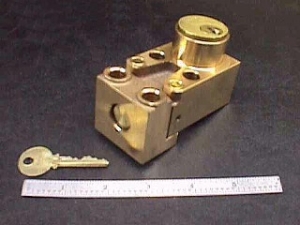 The Superior Locking Unit, type B-5003 is available for single key, two key, and up to six key operations, with and without auxiliary contacts. Many accessories and options are available for these units. Please see cut sheet or call our factory for details. While primarily designed for indoor service, THE SUPERIOR DOOR LOCKING UNIT, type B-5003, may also be used for outdoor service, provided that suitable dust covers are used and sub-mounting beneath the door frame or panel is recommended.